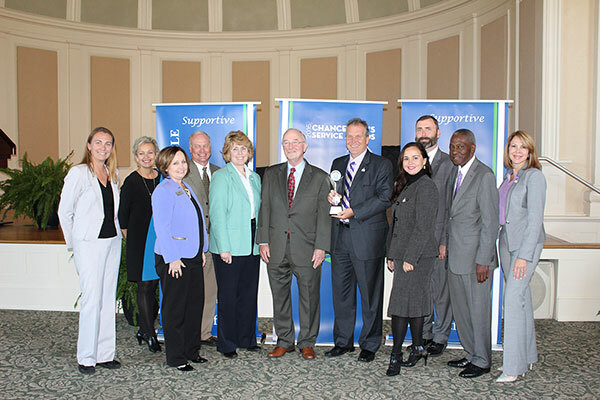 Middle Georgia State University and University president Christopher Blake were named Gold Institution and President of the Year at the University System of Georgia Chancellor’s Service Excellence Awards on Tuesday, Oct. 25. The award was presented by Chancellor Hank Huckaby during a ceremony at Georgia College and State University in Milledgeville. According to the University System’s website, the Institution of the Year awards are presented to “…the institution and president that demonstrated the highest commitment and performance levels in service excellence across the institution over the last year, including ‘Best Practice’ accomplishments and employee activities that foster service excellence.”Nominees are asked to demonstrate five attributes of service excellence: Respectful, Accessible, Informed, Supportive and Responsive. Programs and initiatives that led to the University’s selection as Gold Institution of the Year included its four new graduate programs*, constructed in response to the growing workforce needs of the Middle Georgia region, and strategic initiatives that have included expansion of the University’s aviation program, international studies partnerships, a University-wide plan to increase out-of-the-classroom learning for students, and the collaboration with the Technical College System of Georgia to open the new Georgia Veterans Education Career Transition Resource Center (VECTR) in Warner Robins. This year’s award is the first Institution of the Year award for Middle Georgia State University. In 2015, two MGA employees were presented with Service Excellence Awards in the Front Desk/Help Center and Individual of the Year categories. *Two of the University's graduate programs are pending approval by the Southern Association of Colleges and Schools Commission on Colleges.